Video clip synopsis – An egg is collected from a woman's ovary and placed in a test tube to be fertilised by her husband's sperm. Once the embryo is growing normally it is placed back in the uterus. Broadband MP4 testtube_bb.mp4 (4.1MB), suitable for iPods and computer downloads. 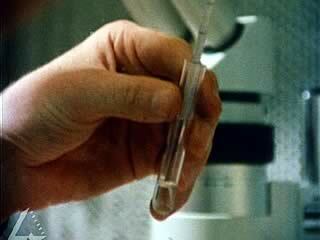 Test Tube Babies is an excerpt from the film Medical and Scientific (12 mins), an episode of the series Australia in the 80s (6 × 12 mins), produced in 1982. Medical and Scientific: A look at Australia’s contribution to science and medical technology and research in the 1980s including innovations in radio astronomy, solar energy and tools and techniques for medical diagnosis, microsurgery and IVF. Australia in the 80s: This series gives a kaleidoscopic impression of the vivid variety and vigor of a nation still developing. As absorbing as the screen image, is the fact-filled commentary. Together they produce a lively film to tell the world about Australia in the 80s. Australia in the 80s was produced by Motion Pictures Associates for Film Australia. In the 1970s scientific research was being carried out into artificial methods of helping women to conceive who would not otherwise be able to do so. One aspect involved 'in vitro’ fertilisation — literally, 'in glass’, referring to the test tubes and dishes involved in the process. An ovum from a female was fertilised by injection of male sperm outside the womb, then placed in the woman’s womb, where it was hoped the embryo would develop naturally to birth. Some people questioned the ethics of artificially manipulating human procreation in this way. Australia’s first 'test tube baby’ was born in 1980. This clip, which was filmed in 1982, shows one of the early IVF pioneers, Carl Wood. At this time, the success rate of IVF was fairly low, with only 20% of IVF procedures resulting in a successful birth. Before watching the video clip students brainstorm all that they know about IVF and surrogacy. Discuss what students know about reasons for infertility. Discuss infertility from the point of view of male and female anatomy and physiology. Discuss the issues facing infertile couples. Why do couples want children? Is there any social stigma attached to couples who can’t have children? What other options are there for infertile couples? Discuss the reproductive issues that have arisen since the introduction of IVF, such as storing frozen embryos, surrogacy and cloning. Consider this video clip in light of other medical advancements during the twentieth century. (Heart surgery, cochlear implants, advances in glaucoma surgery, keyhole surgery etc.) What have seemed to be the most important medical advancements in Australia in the twentieth century? Surrogacy is an issue that has arisen since the IVF program has become more successful. A surrogate mother is someone who gestates and gives birth to a child for another person and then gives custody of the child to the other person or couple. What is the current infertility rate in Australia? What are the two different types of surrogacy? List as many different circumstances as you can think of where people might want to use a surrogate mother. Find out more about the famous Kirkman surrogacy case in Victoria in 1988. What are the laws surrounding surrogacy in your state? Are they the same in all states of Australia? What are the ethical arguments for and against surrogacy?